What Air Force fans need to know as the Falcons begin Mountain West Conference play. Who, where, when: Air Force (1-1, 0-0 MWC) at UNLV (0-3, 0-0 MWC), Saturday, 10 p.m. Eastern. Gambling is illegal in most states (but not Nevada): Air Force is a 10.5-point favorite. Comforts of home? : This will be UNLV’s fourth-straight home game to open the season. They’ve loss all by eight points or less, including last week’s 35-27 defeat at the hands of Washington State. 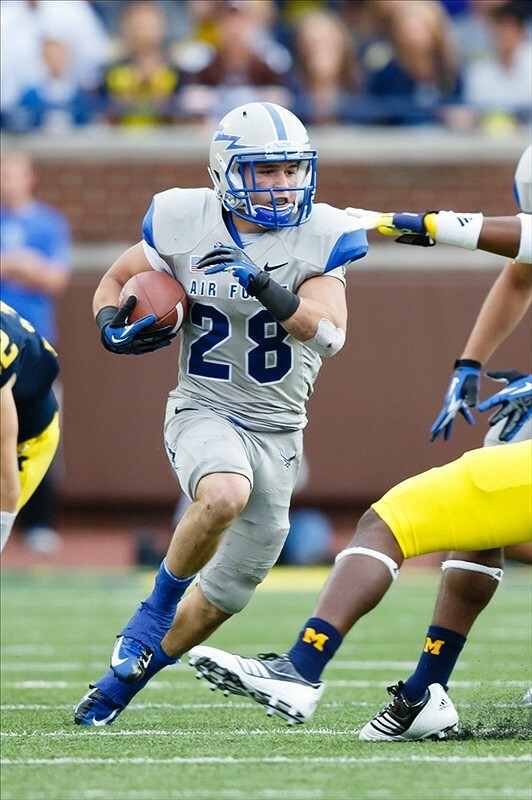 Tale of two backfields: Air Force senior Cody Getz, all 175 pounds of him, leads the nation in points per game (18) and is fourth in rushing yards per game (174), according to the Air Force’s weekly media notes. It’s no surprise the Falcons have the best rushing average in the Football Bowl Subdivision, between Getz, experienced backfield-mates Mike DeWitt and Wes Cobb, and quarterback Connor Dietz, who’s second on the team in rushing with 135 yards. Junior Tim Cornett will carry the rushing load for UNLV (357 yards in three games this season) with two of his fellow Rebel runners off the team for this week’s game. Solving the Falcons: Another week, another opponent scrambling to prepare for Air Force’s option attack. Taylor Bern of the Las Vegas Sun gives a great recap here. Short version: Discipline is key. Slightly longer version: Do better than last year, when Air Force piled up 394 rushing yards in a 45-17 win. From all angles: Playing against a freshman quarterback — in this case, UNLV’s Nick Sherry — should mean an easy week for defensive coaches. Not this freshman — Sherry hit 12 different receivers during his team’s loss to Washington State, going 33-for-50 and piling up 357 passing yards. Sherry won’t run like Denard Robinson did in Michigan’s win over the Falcons, but his ability to distribute the ball will keep Air Force defensive backs and linebackers busy. One possible bright spot: UNLV has three sophomores on its offensive line and only one starter over 300 pounds, meaning Air Force’s own young guns up front — sophomore defensive ends Joseph Champaign and Nick Fitzgerald — could make an impact. Champaign has one of Air Force’s two sacks this season.